Although its interests in the continent are broadly similar, India’s engagement with Africa differs significantly from China. Will it prove sustainable? India’s engagement with Africa has grown remarkably over the past decade. Trade with Africa jumped from U.S. $3 billion in 2000 to $52.81 billion in 2010-11 and is expected to exceed $90 billion by 2015. India has emerged as Africa’s fourth largest trade partner, after the European Union, China and the United States. Its cumulative investment in the continent exceeded $35 billion in 2011 in industries diverse as energy, pharmaceuticals, agriculture and telecommunications. Close ties between India and Africa are not new. Trade has flourished between East Africa and India’s west coast for centuries. India also supported Africa’s struggle against colonial rule and apartheid, and its freedom movement inspired the anti-colonial struggles of African countries, Ruchita Beri, an expert on India-Africa relations at the Institute for Defence Studies and Analyses (IDSA) in New Delhi told The Diplomat. Throughout the 1960s and 70s, India worked closely with the newly liberated African countries to forge common positions on global issues. However, New Delhi’s interest in Africa waned in the 1990s. With the end of the Cold War, India was preoccupied with mending relations with the West and establishing ties with the newly independent former Soviet republics in Central Asia. 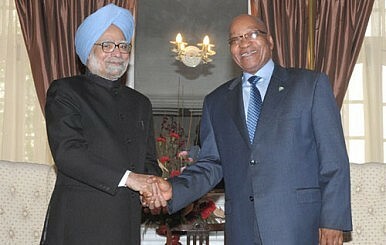 As a result Africa moved to the margins of India’s foreign policy. Rapid economic growth and soaring energy requirements, however, forced India at the turn of the new millennium to rethink its neglect of Africa. India imports 70% of its oil, much of it from the politically volatile Middle East. Finding new suppliers to diversify its oil sources is crucial to its energy security and Africa is an attractive option. Besides oil, Africa is rich in gold, diamonds, platinum, copper, manganese and uranium. India’s diamond-cutting industry – the world’s largest – depends on rough diamonds from Africa, while uranium in Niger, Uganda and Tanzania is vital for India’s nuclear power industry. Bangladesh: Asia's New Energy Superpower? After a favorable UN settlement in June, Bangladesh stumbled upon a wealth of energy. Will investors buy in?